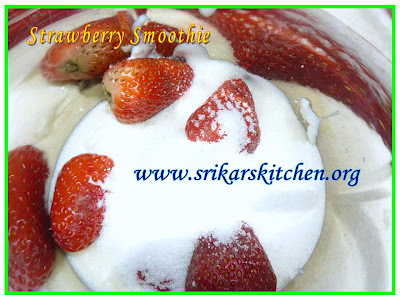 Trim the strawberry & blend everything together. 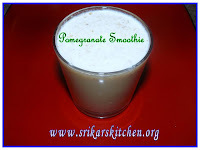 Pomegranate smoothie & Mango Lassi are also being sent to RD for summer Hosted by Anu Sriram. u there in this world?lolaaley kanom? big fan of strawberry here..your smoothie looks tempting. Looks so refreshing and good! Lovely entry. Lovely drink...thats an awesome presentation Sri! My and my son's favorite! Nice entries for theevent too! 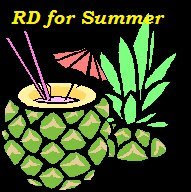 Lovely drink! pics looks awesome! I love smoothies...:) stawberry smoothies is really on top of the list. Nice clicks. Lovely smoothies! Thanks for sending all of them for my event! 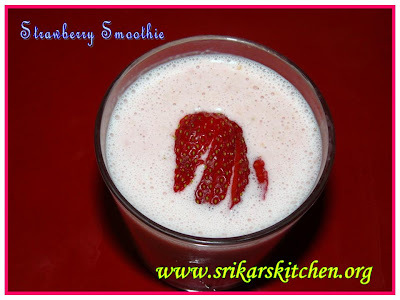 I love strawberry...Smoothie looks yum Sri....nice treat for summer. Smoothies going rounds :) Looks lovely Sri. Very simple. Delicious & looks yummy.